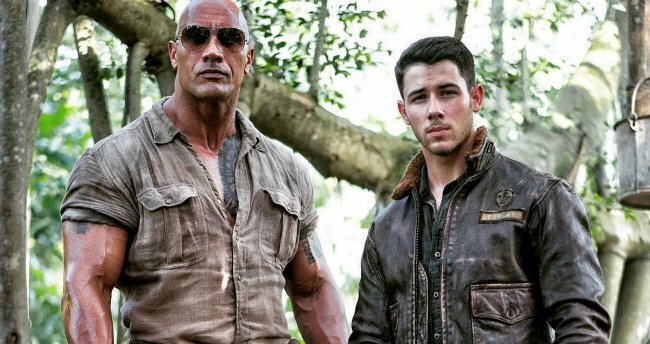 On the eve of Sony Pictures and Columbia’s big trailer reveal, a second, all-too-brief teaser for Jumanji: Welcome to the Jungle has roared online, only this time around, the snippet above contains some actual footage from Jake Kasdan’s fantasy-fuelled adventure, followed by a previously-released set video of Dwayne “The Rock” Johnson waxing lyrical about the perils of life in the jungle. It’s the sequel 20 years in the making, one that’s set to honor the legacy of the late, great Robin Williams, as well as Joe Johnston’s ’90s gem and the novel on which it is based. Celebrated children’s author Chris Van Allsburg is the brains behind the original Jumanji adventure, and now, almost four decades after it was first unleashed upon the world, that deceptively simple board game is about to be yanked upon once again. For in Welcome to the Jungle, four teenagers are pulled into the lush world of Jumanji – it’s the game that plays you, after all – only to find themselves in the boots of four wildly different avatars. Fast and Furious stalwart Dwayne Johnson is at the forefront of that crew as Dr. Smolder Bravestone, and will be exploring the jungle terrain alongside Moose Finbarr (Kevin Hart), Professor Shelly Oberon (Jack Black), and the Amazonian warrior known as Ruby Roundhouse (Karen Gillan). Talk about flipping expectations on their head. In a brand new Jumanji adventure, the tables are turned as four teenagers are sucked into Jumanji’s world – pitted against rhinos, black mambas and an endless variety of jungle traps and puzzles. To survive, they’ll play as characters from the game: meek Spencer becomes a stupid and girl-crazy jock (Dwayne Johnson); football jock Fridge becomes a tiny Einstein (Kevin Hart); It-girl Bethany becomes a bookworm professor (Jack Black); and unathletic Martha becomes an amazonian warrior (Karen Gillan). To beat the game and return to the Planet Earth with their lives, they’ll have to start seeing things in an entirely different way. Ready for a rumble in the Amazonian jungle? Jake Kasdan’s long-in-development Jumanji sequel will formally welcome you into an alternate dimension of great beasts and ancient puzzles on December 22nd.